eatingclub vancouver: Korean Sprouts & Spicy Cold Cucumber Salad: One Dressing to Rule Them All! Korean Sprouts & Spicy Cold Cucumber Salad: One Dressing to Rule Them All! I've always disliked mung bean sprouts. More often than not, I would encounter them cooked. I have never liked their watery, soggy selves. Then, lo so many years ago, I ate some sprouts at a Korean restaurant. I loved them! The "heads" of these Korean sprouts were much larger than regular ol' bean sprouts, so I tasted more of the bean than those watery, leggy, pale stems of theirs. I have now discovered that those are soybean sprouts. That dish I tasted in the restaurant was, of course, kongnamul. 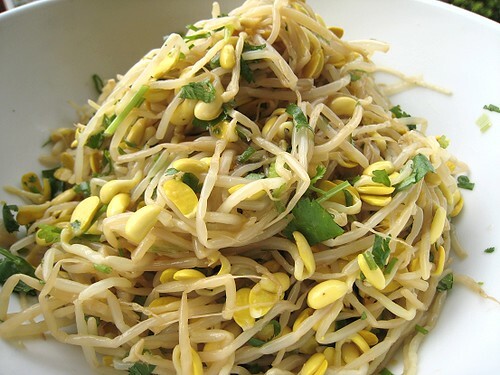 We have never attempted to cook soybean sprouts at home until I saw the recipe in Mark Bittman's Best Recipes in the World. To make kongnamul, the sprouts are boiled and drained, then dressed with sesame oil, soy sauce, green onions, garlic and sesame seeds. I have since made this many times and, dare I say it, "made it my own". For my soybean sprouts, I use both soy sauce and add salt. I found too much soy sauce made the dish too brown-looking. I also add cilantro because, well, I can't help it! We're a cilantro-loving people. We don't usually have sesame seeds on hand, so I don't stress about it. I do love them seeds, though. I also add sugar to balance out all the flavors (not to make it sweet). I may or may not add just a touch of rice vinegar. This is good warm, room temperature or cold. The latter I know from always pulling it out of the fridge late at night before going to bed. This very Asian flavoring is good with other vegetables as well. Case in point, cucumbers. This has the same soy sauce, sesame oil, green onions and garlic, as well as my additions of sugar and rice vinegar. No cilantro this time. You'll be amazed at how one herb can make these two dishes so different from each other. I also added a whackload of sliced chile peppers. And there you go, these two dishes proudly sat side by side at Dear Niece's Birthday Bash. One Dressing to Rule Them All! Don't stop with soybean sprouts and cucumbers. This one dressing (to rule them all!) would also go nicely on seaweed, firm tofu or even soft tofu. It can go on hardier vegetables like broccoli or cauliflower: sliced very thin if raw, or in little florets if blanched. Or green leafy vegetables like some wilted spinach. One could use it for a different take on coleslaw, or even as a dressing for sautéed or braised Napa cabbage. Or even use it on jellyfish, if you're so inclined. We're submitting this post to Weekend Herb Blogging, a world-wide food blogging event created by Kalyn's Kitchen with the goal of helping each other learn about cooking with herbs and unusual plant ingredients. If you'd like to participate, see who's hosting next week. WHB is hosted this week by Simona of Briciole. Both dishes look deliciously refreshing and very tasty! You made me want to try and make the Korean sprouts: I have never had them, so now I am curious and want to taste them. I'm all over that cucumber salad and as for the Korean Sprouts...gotta try'em 1st! You make it all sound sooooo good and so are the photos. I'll definitely have to find some Korean sprouts ASAP! The dressing sounds like a true winner! I don't have sprouts very often, but this makes me want to have them more often! It's great to have a dressing that is so versatile and works with so many different dishes! thanks so much for stopping by my page. your page is chalk full of great but UNIQUE recipes, very inspiring. personally, i am not a fan of bean sprouts (water chestnuts are worse tho). your korean apps look delish tho. i've been wanting to make the cold mashed potatoe salad for awhile. this just might prompt me to do so! I find rice vinegar and sugar is a deadly combination when it comes to making light side dishes. I'm a die-hard fan of the cucumber, and you can try it with lo bok as well. It's great for the hot summer months! go ahead and register and search for "broccoli stem"
Ah, the cucumber remembers of the pickled cucumbers my mom does, only she juliennes them rather than slice them. Got a question regarding the cucumbers here: do you put the dressing right before serving or put it in advance? When I asked my mom, she will leave it to "marinate" for 30 minutes; however, when I try that, the cucumber starts to turn yellow. If I don't marinate it long enough, it does not have the same kick. Like your addition of cilantro into the salads. It shd taste quite different from the usual but differently good! yum! i love kongnamul, especially in bibimbap...sigh. also, if you like kimchi you should try out oi kimchi. it isn't too dissimilar from your cucumber salad. i made some a few weeks ago and it was fantastic. Yay - Korean side dishes. Sounds very authentic to us! Thanks for coming to our site. It's all about making things your own. I find it hard to cook bean sprouts right. I usually end up with mush. Tasty mush, but mush nonetheless. Oh yes! It's been a while since CSC and I have done something from your upcoming cookbook. Broccoli pickle sounds good and refreshing! I did dress the cucumbers and sprouts in advance. Mine didn't turn yellow, although they turned a little brown because of the soy sauce. That's why I try to keep the spy sauce to a minimum and use salt for seasoning. The color doesn't really affect the taste, though. Yeah, _Best Recipes_ and _How to Cook Everything_ are good go-to cookbooks. Perfectly cool and crisp! I love those veggie banchan served in Korean restaurants, so healthy and abundant. So beautiful and healthy! That looks just perfect for summer dining. Both of them are so refreshing and healthy. I would love for you to send these 2 salads to my ONE DISH MEAL- Salad event that I am hosting. Do check the rules in my site. Thank you and will look forward to a recipe from you. 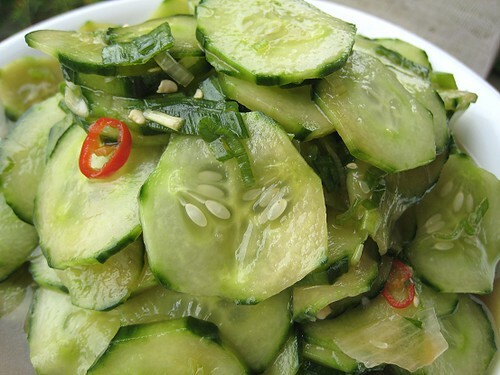 Try adding some ground red chilli flakes to the cucumber salad. That's how they do it in Korea! Can really spice it up, or go mild. Copyright © 2007 - 2014 by ts & js of eatingclub vancouver. All rights reserved. Legal stuff.